It’ll be a homecoming of sorts when an Iowa native musician returns to Ames to perform this weekend. 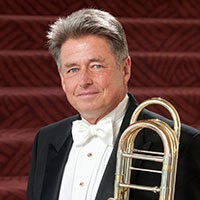 John Engelkes grew up in Parkersburg and now plays bass trombone with the San Francisco Symphony. He travels all over the world with the symphony which will play Friday night in concert at C.Y. Stephens Auditorium at Iowa State University, though he’s been there before. “When C.Y. Stephens opened, I went and heard the New York Philharmonic and I think I was 15 years old, ” Engelkes recalls. “Things are coming back full circle for me. This will be the first time for me (to perform there) so I’m really anxious to be there and play there.” Now the oldest member of the symphony’s brass section, Engelkes serves on the faculty for the San Francisco Conservatory of Music. He also played with the Baltimore Symphony and the Minnesota Orchestra, eventually finding his way to San Francisco — where he’s now been for 38 years.